It seemed, after the Leadman 125 race, that my finishing mattered to some folks other than me. In the aftermath of Ironman Arizona 2011, I think that I believed that people cared a lot about why I did not finish that race. After venting (sorry, bad pun), it became clear that no one really cared that I didn’t finish; they just cared that I was okay. After the Leadman race, I didn’t expect that it would matter to anyone why I did finish despite all of the mishaps on the day. But at the awards breakfast, for the first time – and hopefully only time – I’ve ever been asked to say a few words after a sixth place performance, it became clear that it mattered to some people that I did finish. So I thought I’d share a (slightly) polished version of what I had to say then. The first – and most important – reason is that I could. And I don’t mean hands-and-knees-crawling-Julie-Moss-style to the finish. I meant that my body was fine. Changing flat tires is something I’ve done plenty of times in training. And while it was certainly draining – both physically and, especially, mentally – to deal with that bad luck out there, it was nothing that put me physically at risk. And, given the (relatively) modest distance, the race wasn’t something that simply finishing was going to really break me down. Running a marathon in an Ironman “just because” is not something I’d recommend; if you want to do it for your own reasons – as I probably would have in 2010 if I’d had to – that’s fine; but I think it can also be braver to pull the plug, especially in something as grueling as an Ironman. And, were this the 250, I might have also considered calling it a day more seriously; though, at the 250 distance, I think you could probably recover from two flats and still have a prayer of winning… But ultimately, this wasn’t either of those situations, so I don’t need to speculate. I knew I could finish and not hurt myself (anymore than the good hurt of racing hard) by doing so. And that’s why I did. Or, rather, that’s why I didn’t not finish. 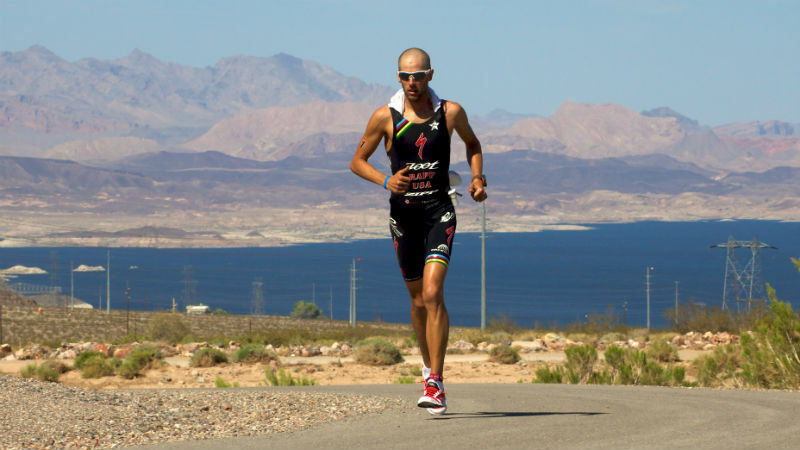 The second – and simultaneously less and also more important – reason is what I think Leadman; and, in a larger sense, triathlon; and, in an even larger sense, racing in general is really all about. There is something special about tackling a challenge with a bunch of other equally crazy people and sharing that experience while also having it just for yourself. Leadman primarily represents both a race against yourself and against the clock/course/conditions. That isn’t to denigrate the other athletes in any way; it’s just that the nature of the course – especially with the conditions on Mar 31, 2012 – that it was really about getting out of yourself what you were able to give. There were no real tactics. It was just a grind. And while I am glad for races that are “races” for the opportunity to test yourself against someone else, I also think those rare opportunities to test yourself in a relatively solitary way are also special. There’s something magical about Ironman and the crowds and the fact that there are so many people out there chasing that 140.6 distance. But there’s also something magical about a small race where you are alone much of the time, at a distance that basically has no expectations or meaning beyond the day, and the chance to see what you can find inside of yourself that you might not have known was there when you are. In 2011, this race – at the 250 distance – gave that to me in a very profound way. And on a day when everyone was dealing with some kind of adversity – like raging winds and hot desert temperatures (it was almost 30F degrees cooler on Sunday…), I felt like this was also the kind of day that gets remembered. And I had the chance to define that memory for myself. And I don’t know that I’ll always be proud just to finish. But I have been before – at LA in 2010, at IMAZ in 2010. And I was proud again on Saturday. Hell yes Rappstar! Your story continues to inspire triathletes across the world. Personally I would love to see you at the top of the podium again, but it is great that you are racing again. Some of my favorite races are the small ones that are more meaningful. Great work in Nevada man! Great description of the day. That landscape, it does almost feel like you are on another world. I felt like the cars were almost like space vehicles passing us, the people inside totally shielded from the environment. But we were out in it in a very real way. Much more of a wrestling match with myself (and literally wrestling with my bike) than I'm used to. I'm definitely going to remember it. Thanks for putting into words what so many of us were feeling – as an amateur, your career and blog is inspiring!